A business establishment not consist of a single system but several integrated systems. To handle with such complexities, SAP Process Integration platform provide a single point of integration for all systems without touching existing complex network of legacy systems. 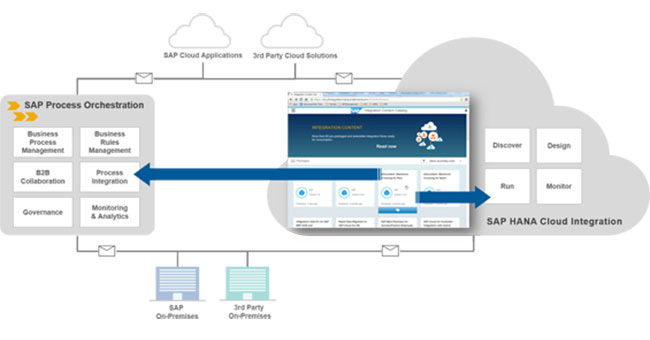 This is a powerful middleware to provide seamless end to end integration between SAP and non-SAP applications inside and outside the corporate boundary. SAP Process Orchestration supports B2B as well as A2A exchanges, supports synchronous and asynchronous message exchange and includes built in engine for designing and executing Integration Processes. Optimize IT operations, and innovate business processes faster to become a best-run business.